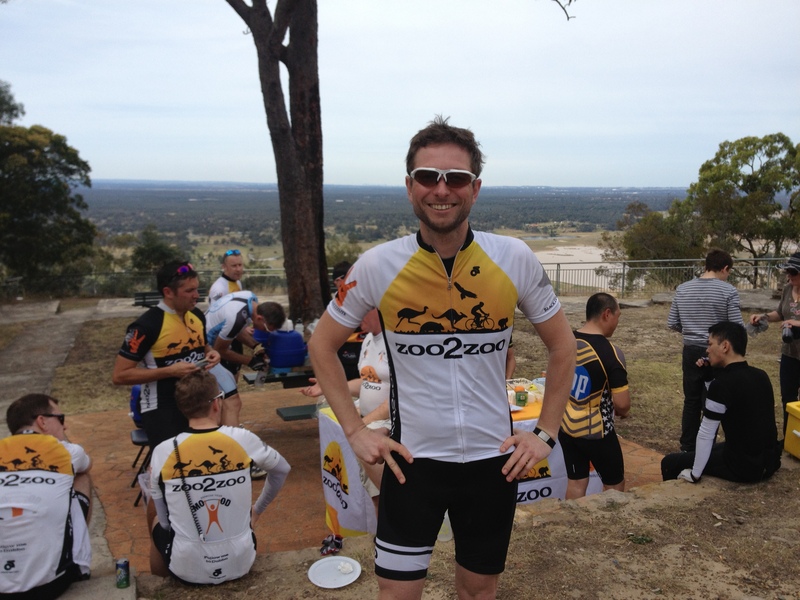 Just back from my first official Zoo 2 Zoo training ride. Essentially it was a dress rehearsal of the Day 1 course from Sydney’s Taronga Zoo to the Blue Mountains, without the last bit to Mt Victoria. Which is probably just as well based on the way I felt as I limped into Wentworth Falls at about 1:15pm. As we rolled out from Mosman at 7:15am, after a quick briefing at the Zoo from event organiser/legend Andrew, I felt good. 50km later in Windsor (actually 85km for me – I rode to the start), I still felt good. Then things went a little bidon-shaped, as every rider knows they sometimes do. I’m not going to lie or talk it up. For this C-grader the second half of the ride was bloody tough going. But, despite running out of water with about 20km to go and feeling like I was towing a BBQ, I got there without stopping or walking. I’m proud of that. Like most searching rides, however, the whole process was also extremely rewarding (when it was over, that is – at the time it was a god-awful painfest). Throw in the fact that I kept reminding myself it’s all for a very important and worthy cause, the Black Dog Institute, and hand-on-my-heart-rate-monitor-strap, it was still a darn fine way to spend a Saturday. The weather couldn’t have been better. As I pretty much knew I would, I met some great people today – both fellow riders (including two from my club whom somehow I’d never met before) and also several angels masquerading as our support crew who did an awesome job with their constant words of encouragement – not mention their magically-appearing trestle table laden with more treats than a 6-year old’s birthday party. Seeing that table set for lunch at the top of the Yarramundi climb was quite possibly one of the highlights of my life. I could have kissed them. In fact, just thinking now, given my oxygen-deprived mental state at the time, maybe I even did?! Hard stats for the ride? Well, all up door to door I covered a whisker under 150km and climbed nearly 2,500 metres in the day. This may qualify as an ‘average’ ride for some. But for me, well, they’re big scary numbers. Thankfully, a hot shower and several beers later, I feel remarkably good again. This is just as well, as when we do the full ride in October, Day 2 is even further – 180km – so recovery will be rather important. Can’t wait for the big one now. 450km from Sydney out to Dubbo’s Western Plains Zoo, via Bathurst, Orange and, no doubt, plenty of pain. Bring it on…! Awesome mate. Simply awesome. And you rode to the start…..